Heat oven to 350°F (325°F for dark or nonstick pans). Place paper baking cup in each of 24 regular-size muffin cups. Make and bake cake mix as directed on box for 24 cupcakes. Cool in pans 10 minutes. Remove from pans to cooling rack. Cool completely, about 30 minutes. Meanwhile, divide frosting between 2 small bowls, about 1 1/4 cups each. Mix 7 drops red food color into one bowl, yellow into the other. Remove paper baking cups from cupcakes. Place upside down on serving platter. To make bunny cupcakes: Frost 12 cupcakes with the pink frosting. Cut shapes out of strawberry taffy candies for ears, feet and tail. Cut shapes out of grape taffy candy for ears and nose. Make ears by stacking grape candy on top of pink candy. Trim to shape into bunny ears if necessary. Press firmly into cupcake. Slide strawberry taffy cutouts under cupcake to make feet. 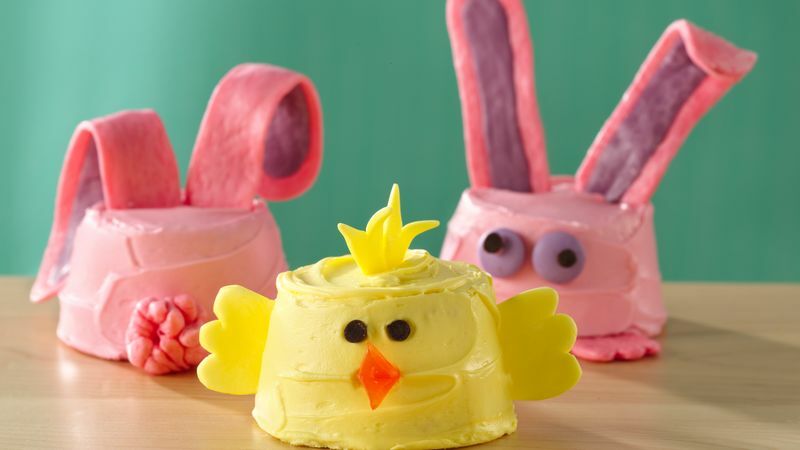 Make small ball out of taffy and press onto back of bunny cupcake for tail. Add small nose. Gently press chocolate candy on face and use frosting to place miniature chocolate chips on chocolate candy for eyes. To make chick cupcakes: Frost 12 cupcakes with yellow frosting. Cut shapes out of banana taffy candies for beaks and feet. Cut shapes out of orange gumdrops for wings and comb. Press orange gumdrops firmly into cupcake. Slide banana taffy cutouts under cupcake to make feet. Add beak. Gently press miniature chocolate chips on face for eyes. Didn’t use up all of the frosting and decorations? Spread leftover cookies with frosting for a sweet treat. To make ahead, bake and freeze the unfrosted cupcakes for up to three months. Frost and decorate the frozen cupcakes, and let thaw at room temperature.